If you’ve ever looked at a picture of graphene and compared it to your kitchen sieve, you weren’t alone. Researchers from the University of Manchester, the birthplace of graphene, reckon it might be the perfect mesh with which to filter different isotopes of hydrogen. Using sheets of graphene, the researchers have been trying separate different isotopes of hydrogen—plain old hydrogen and deuterium, which has one extra neutron at its core. It’s not just an academic exercise: nuclear power plants require heavy water in which regular hydrogen is switched out for deuterium and the separation of pure deuterium is expensive, so being able to easily filter the two from each other could be pretty damn useful. 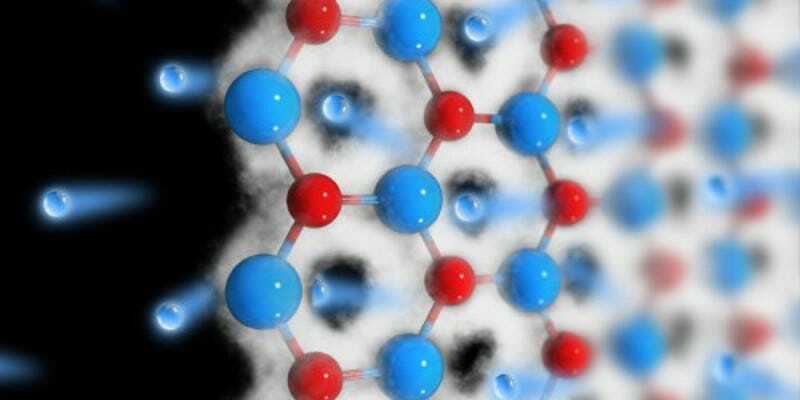 In a series of experiments published in Science, the team has shown that it can use graphene to filter protons—which are the nuclei of hydrogen atoms—from heavier nuclei of the hydrogen isotope deuterium. The deuterium nuclei simply get left behind as the smaller protons pass through the sheet. It’s a neat and apparently unexpected discovery, as theoretical predictions suggested to the researchers that both may pass through.